While the Easter Bunny is busy hiding chocolate eggs, many will be enjoying a few hard-earned days off this weekend. Easter is an opportunity to spend quality time with family — be it on a camping trip or relaxing with loved ones (both of the human and pet variety) at home. However, this weekend may also be the right time to share the love by settling in a new addition to the family that will make both your lives fuller and richer. Operating every day this long weekend — except Good Friday — The Lost Dogs’ Home shelters have many deserving cats, kittens, dogs and puppies who are all looking for a place in your family portrait. If you have been considering adopting, now is the time to take action! Hop along to one of our shelters and take the time to meet our fabulous residents, each with distinctive personalities, temperaments, appearances and of varying ages but who share one common denominator — they all deserve the chance to be loved. Shelter Operations Manager, Jodie Addamo, said holidays are an ideal time to introduce a new pet to your home: “Without the pressure of work and the nine-to- five grind people are generally more relaxed and have the time to settle in a pet. This weekend saw a total of 14 cats and kittens and 17 dogs and one puppy adopted at the North Melbourne Shelter alone, with more waiting to be a part of your family! All adoption candidates are desexed, microchipped, vaccinated and have had a full health check prior to going up for adoption. View our cats and dogs currently up for adoption to learn more about them before coming to the shelter. Adopters who sit the Pet Licence Test — a free and interactive way of learning about responsible pet ownership — will receive a discount. Don’t forget, you can take the test online today to avoid delays at the shelter! No chocolate was consumed by models during this photoshoot! Half-price cat adoption promotion ends soon! Wrapping up at the end of Easter, this promotion has seen many deserving cats and kittens adopted at our Campaspe and North Melbourne shelters so far, with plenty more looking for a new home. Whether you are after an older cat with an established routine, or a feisty and energetic kitten, you are sure to find your ‘purrrfect’ match at our newly renovated cat adoptions centre. Each adopter will need to take the Pet Licence Test to receive the 50 per cent discount on the adoption fee. 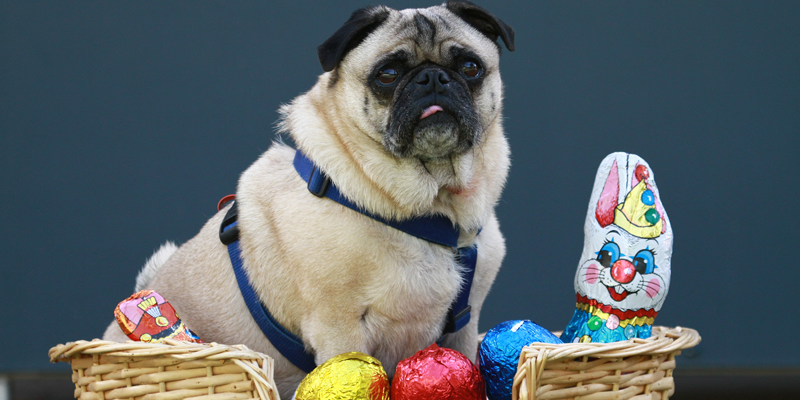 Check out our contact page for more information on shelter operating hours and watch this space later this week for tips on caring for your pets over the Easter break.